Newly appointed Executive Pastry Chef Josh Johnson began working in pastry as a teenager in his uncle Richard Rivera’s pastry shop, Ambrosia Euro-American Pâtisserie in Barrington, Illinois. Johnson then went to The Ritz-Carlton Chicago Hotel where he received the invaluable guidance from Chef Sébastien Canonne, M.O.F., co-founder of and dean at The French Pastry School, as well as Chef En-Ming Hsu, World Pastry Champion. He was inspired to move to New York and work at Payard’s Pâtisserie & Bistro. Johnson returned to the Midwest as Executive Pastry Chef for Everest, then rejoined Ambrosia Euro-American Pâtisserie. Josh Johnson’s next venture lead him to co-owning Cocoa Bean Fine Desserts in Geneva, Illinois. He was then brought on as a pastry chef instructor at The French Pastry School of Chicago. Chef Johnson competed in and won the National Pastry Team Championship with team captain Donald Wressell and fellow French Pastry School instructors, teammates Scott Green and Della Gossett. The team went on to win Best Dégustation and Silver Medal overall at the 2012 World Pastry Championship in Las Vegas. 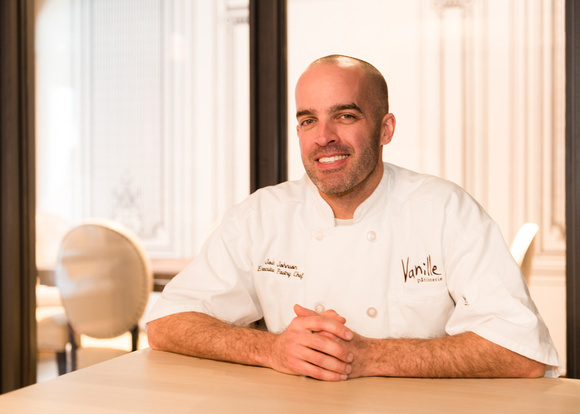 Johnson brings to Vanille vast experience, limitless curiosity, passion for the craft, superior knowledge, and devotion to the never-ending art of pastry.